That was the mainsail sheet mounting system on my ex Lipari. Will you use the Karver setup or the Amsteel 3/16" line automatic system ? well none of them I 'll say ! when I'm rising the main, I hook both of the wichard hook ( rope one and railway one ) and then up ! I have recently fitted a dyneema strop running from the Wichard hook through the head ring, back through the Wichard hook and fastened at the first batten car. It works a treat! Just needed a little fine tuning of the length. Next question: Has anyone fitted a downhaul on the main? I have been chatting with a couple of Lagoon owners. I think Lagoon fit them as standard and it seems to work well. I also think we need 2 other changes on the Lucia. The Lazy bag needs to be a bit bigger/deeper and we need 4 lazy jacks spreading all the way to the end of the Lazy Bag. That will be a task for this winter. We lift on October 16 and I plan to get it done then. We are currently on Paros and in the bay is a Lucia, no one on board. Greek flag, may be for charter. The Antal V Cam clutches grip really well and don't seem to be too hard on the ropes. HOWEVER they do not release the line fully and there is a lot of friction when pulling the line through the open clutch. I can't see any way of adjusting the open position. Has anyone got a solution to this? It makes things unnecessarily difficult and tests my restraint regularly. Short of going for the smaller rope diaameter I can't see one. God bless the forum. I've been cursing the square top sail wondering how to fix the stupid way this is set-up. It is so unseamanlike to have a cruising boat where you need a member of the team to climb up the mast in order to attach the head of the sail to the mainsail car. Has anyone got an update on the strop solution below and what diameter/length dyneema are you using? The strop that I made up looks a little Heath Robinson but works beautifully! The length is critical and you should only use my measurements as a guide and fine tune the length by trial and error. You don't want it too short as it will free the luff above the batten and too long will free the leech. What I did was use a soft shackle to attach it to the batten end and then tie the tie the strop onto the shackle so I could play with the precise length. The plan was to then put an eye splice in the strop at the exact length of the knot but I confess that I have not got around to that yet an thus the Heath Robinson comment! 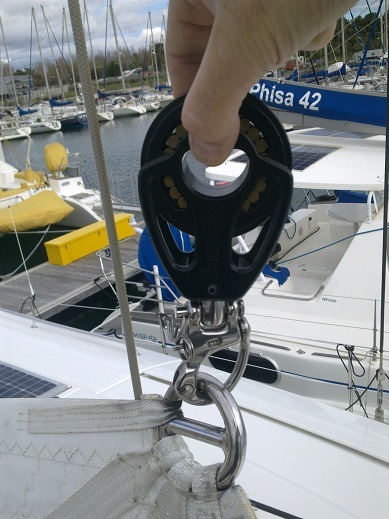 I will continue to use the soft shackle as you want to be able to take it off the batten easily. I will see if I can find a photo of it in action and post that. I used 5mm Dyneema and some anti chafe sleeve in the critical spots. I only had a short length but would prefer to cover the whole strop. I would have like to remove the Wichard snap shackle but when I tried that it looked like the strop would chafe against the head car. This is what the Auto Square top sail should look like. Has anyone else with the Karver hook changed our their soft shackle like this? Hi, we’ve had no problems since we ensured our soft shackle had the T join at the sail and, not the Karver end. Our soft shackle pops onto and off the karvery hook. However I quite like the shackle option. Good to hear. We've only had the sail stuck at the top of the mast one time. (but we've heard the same story from 3 different owners) When we raise the main we make sure the soft shackle is over the hook within the first 15 feet from the deck. We've never had the dogbone near the hook, but rotating the shackle 90 degrees from time to time helps. maybe I did not catch the origin of that seems a FREQUENT problem, but is the following Lucia 40 option OPT0571370 Hook for Main Sail ... could solve it ? 1) ensure that the dyneema loop join is at the sail end, not the hook end. The hook is the problem. Well, more specifically, the dyneema soft shackle that is looped thru the headboard and around the halyard. (in the youtube video above this soft shackle has been replaced with a hard D shackle). The problem is that the soft shackle forms down to a diameter smaller than what is needed to lift up onto the Karver hook. As a result, while raising the main, the soft shackle pinches the halyard down on the hook. This still lets you raise the main, but creates a lock that prevents the sail from dropping when the halyard is released. To avoid this, special attention needs to be paid while raising the main to make sure the dyneema loop gets over the top of the karver hook and down into the bend. The thought of replacing the soft shackle with the hard shackle (as demonstrated in the video) is that the hard shackle makes it over the point of the karver hook much easier. The down haul helps getting the sail down the last few feet. We don't have one as I'm able to pull down on the luff by hand then push up on it which lifts the headboard and shackle up over the karver hook. The down haul lets pull the karver hook down, releasing the headboard as the sail will want to stay up the mast that last few feet because of the diagonal batten.